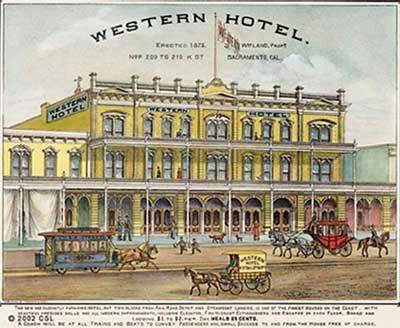 Hand-Colored 1880 Lithograph, 11¼" x 14"
Constructed by William Land in 1875, this hotel was one of the largest in the West. It was built on sites of earlier hotels of 1853-1854. This new and elegantly furnished hotel, but two blocks from Rail Road Depot and Steamboat Landing, is one of the finest Houses on the Coast, with beautiful frescoed walls and all modern improvements, including Elevator, Fire Hydrant Extinguishers and Escapes on each Floor. Board and Lodging $1 to $2 per day. Meals 25 cents. A Coach will be at all Trains and Boats to convey Passengers and small Baggage to and from the House free of charge. Like the original Sacramento Bee Building and many other historic buildings, the Western Hotel was apparently razed to clear a path for Interstate 5. We were unable to locate a commemorative marker.